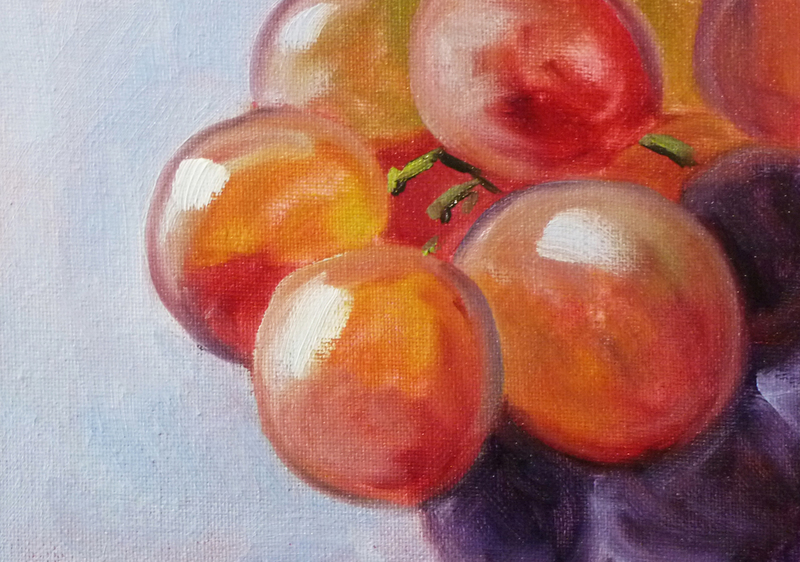 Now that Christmas has passed and visitors have gone home, I've finally had some time to get back to painting. Today's painting is 5x7 inches on a canvas panel. It is for sale in my Etsy Shop and can be viewed or purchased by clicking this link. It is that time of year when these little cuties are on tables everywhere. Their bright color makes them delightful to paint. 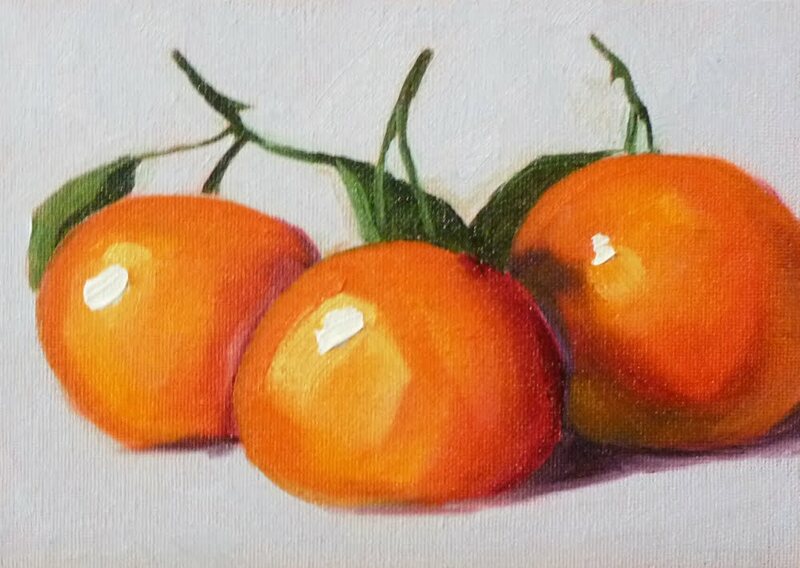 Although this painting has SOLD, there are a number of other small tropical fruit paintings, for sale at my Etsy Shop, Small Impressions Paintings. This painting is a 5x7 inch oil painting on a canvas panel. The paintings for sale in my Etsy shop range from a small 4x4 inch painting up to a size of 11x14 inches. I hope you will stop by for a visit and view the entire collection of small format oil paintings for sale. 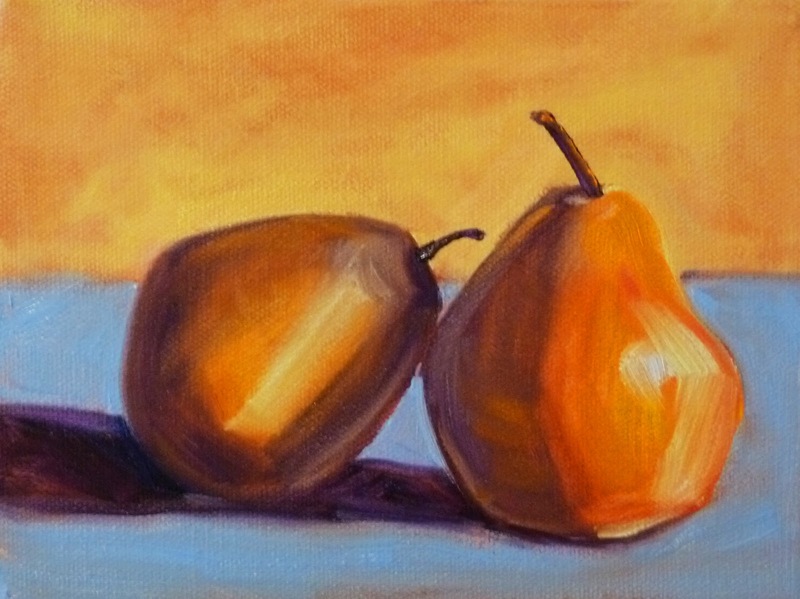 Today's 6x8 inch painting was inspired by a couple of golden pears. It is wonderful that such delightful fruit is available when the weather is cold. Their sweetness brings a taste of sunshine to a cold winter's day. The painting can be purchased or viewed in my Etsy Shop at this link. With the cold weather in full force, I dug around in my collection of bright, sunny paintings and found this 9x12 inch oil painting that I created last summer when the weather was warm and flowers bloomed in the backyard. It is now for sale at my Etsy Shop, Small Impressions Paintings. Like most of my paintings, it was created with artist grade oil paints on a gallery-wrapped canvas. Staples are on the back, so it can be hung with or without a frame. I hope someone who is longing for some sunshine will purchase it and make their home a little brighter. Click here to view it in the shop or make a purchase. This link will take you to the shop where you can view some of my other tropical fruit paintings. Cold, cold, cold. 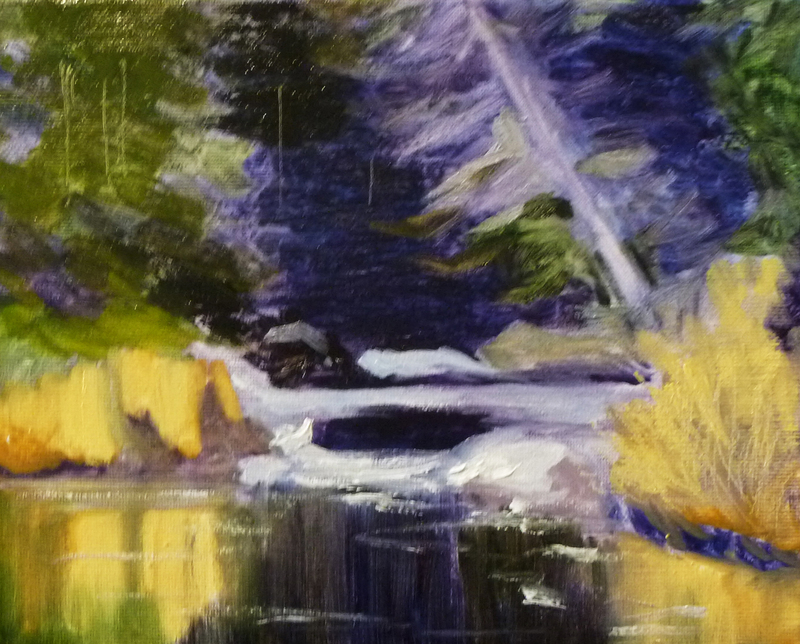 It is here for a while, so chilly landscapes are finding their way to my canvases. Though beautiful, the water is ready to shock anyone who might accidentally dip their foot. This painting of a mountain creek is for sale at my Etsy Shop, Small Impressions Paintings. Click here to view it or make a purchase. 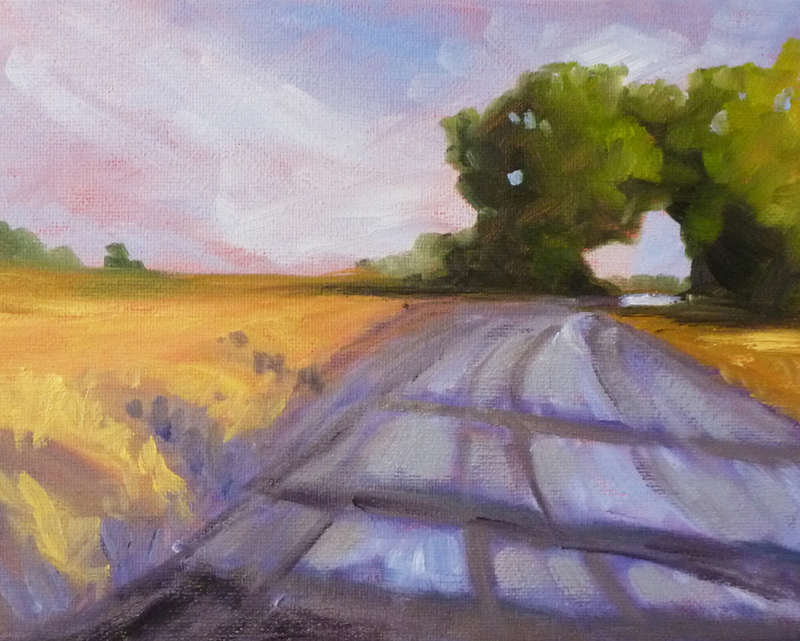 You can also view my other landscape paintings at this link or this one. Although I've been riding my bicycle during the winter months, nothing beats riding in the warmth of the summer sun. I'm getting tired of the cold, the three shirts, the two pairs of socks, and the double layer of pants. It is only when painting that my imagination takes me to those warm weather rides that I'm missing. 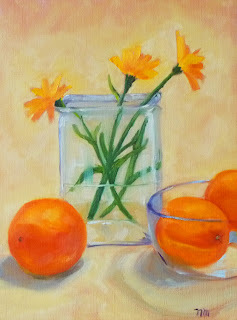 This 8x10 inch oil painting, created when I was longing for warmth, is for sale at my Etsy Shop, Painting Small Impressions. Click here to view it in the shop or make a purchase. The holidays are so busy, I've had trouble keeping up with postings. Luckily, painting has still been on-going. With the season in mind, red is the color I've had my eye on. 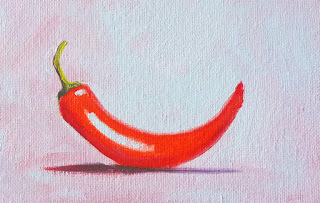 This little red pepper decided to go along with my desire for red and dressed appropriately. She is for sale and can be viewed or purchased here, or you can view all of my paintings for sale at this link.